“Four Mothers: A Novel” from Christian Faith Publishing author Steven Snyder is about the life of James and his mothers. From adoption to reunion, marriage to divorce, health to sickness, his faith is tested, but the four mothers are there to help him through it all. “Four Mothers: A Novel”: the tale of a man who lives with love and loss. “Four Mothers: A Novel” is the creation of published author, Steven Snyder. Steve Snyder was born at St. Joseph’s Hospital in Houston as James McAlexander. After spending a number of years at DePelchin center, he was adopted into a loving family. He later attended Texas A&M University in College Station, Texas where he studied petroleum engineering and geology. While at A&M, the author developed a love and respect for car racing, which eventually led to national championships in both amateur as well as professional circuits. In the 1990s, he became an avid hunter. In 2013, he retired from a major engineering and construction firm in Houston where he had been employed as a compressor specialist. In early 2014, the author was diagnosed with parkinsonism, a disorder similar to Parkinson’s disease. Published by Christian Faith Publishing, Steven Snyder’s new book tells the tale of an every man hero who must struggle with a life of love and loss. “Four Mothers” tells the story of James whose mother gave him up for interim care, which eventually resulted in his adoption by another woman. As a grown man, his birth mother finally manages to reenter his life. As he starts to know his mother, he learns more and more about himself. In the meantime, James forges a successful career in the oil and gas business, yet struggles to deal with the chicanery of clients. He has two marriages with one based on trickery. He is then stricken with a severe illness, which tests his faith. With the help of the four mothers, he does, however, rise to the occasion. View a synopsis of “Four Mothers: A Novel” on YouTube. Consumers can purchase “Four Mothers: A Novel” at traditional brick & mortar bookstores, or online at Amazon.com, Apple iTunes store, Kobo or Barnes and Noble. 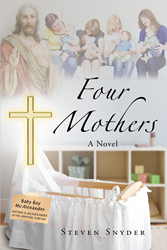 For additional information or inquiries about “Four Mothers: A Novel”, contact the Christian Faith Publishing media department at 866-554-0919.